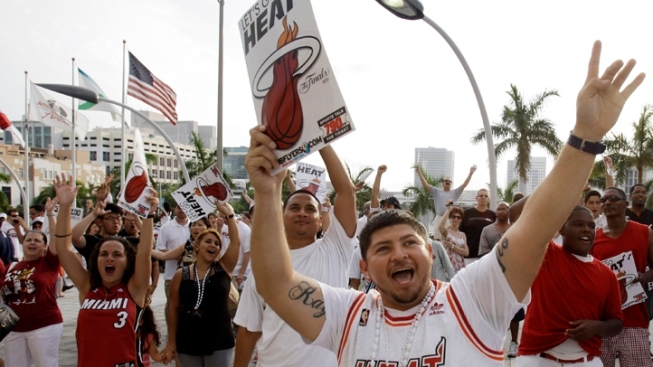 Miami Heat fan Edgar Obando of Miami yells outside American Airlines Arena before Game 6 of the NBA Finals basketball game against the Dallas Mavericks Sunday, June 12, 2011, in Miami. 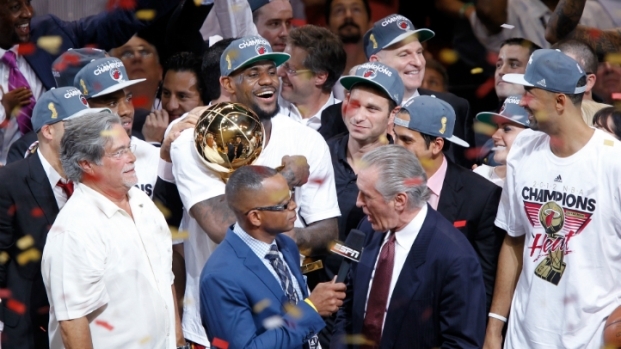 The pivotal playoff game between the Miami Heat and the Oklahoma City Thunder starts Thursday night. A great location should have an equal amount of spirit as the stands in the basketball arena. 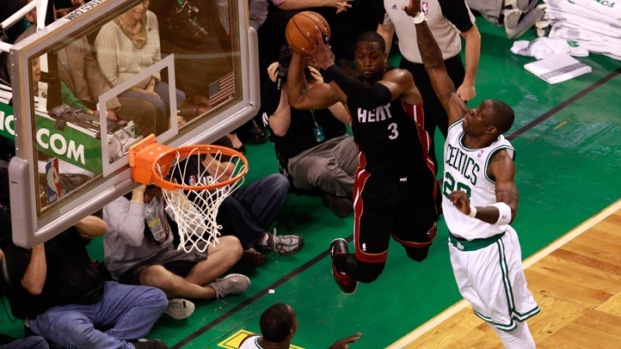 If you weren't lucky enough to score a ticket to Game 5 at the American Airlines Arena, you can still get some Heat action in South Florida sports bars. Here are 10 fun sport bars to ensure a fun and exciting time tonight, with some great food and drinks. Make sure you get there early to ensure optimal seating! Sports Grill: Known for serving the best chicken wings in Miami, the bar features all sporting events through multiple flat screens in their four South Florida locations. During Heat games, Sports Grill offers a budget friendly price of $8.50 for pitchers of Bud Light and Miller Light. The Yardhouse: This bar would be ideal for those looking for some delicious food and drinks while watching the game from several televisions. The Yardhouse offers a spectrum of beers - from pub cream ales to dark lagers. For the wine buffs, Yardhouse also offers a large selection of fine wines. Flanigan's Seafood Bar and Grill: This chain bar has 22 South Florida locations and is legendary for their baby back ribs. Flanigan's has several meal deals for the economically conscience and a great happy hour, where all drinks are 50 percent off. Buffalo Wild Wings: Another chain bar where most game nights are packed with exuberant fans. With televisions displayed on the walls of all three South Florida locations, you are guaranteed to get a great view of the game and a fun time. Ted's Hideaway: This gem is a great dive bar with a casual yet thrilling atmosphere. Game nights have drink specials. You're ensured the full game night experience with surround sound on all televisions. To read more about the Heat, click here. Sunset Tavern: This place has a great outdoor seating area, and some draft beer selections. Their happy hour includes half off drinks and an accompanied dollar menu for some good food. The Tavern is located in Sunset Place. Doral Billiards and Sports Bars: The bar has 16 HDTVs and five giant screen projectors, where you won't miss a second of the game. During half time you can shoot some pool. The bar offers more than just beer because every night is hookah night. Gordon Biersch: This place is for beer lovers, where the beer is freshly brewed and beer can be experienced like it ought to be. Their culinary passion also goes into the fresh food that is prepared daily. There are several TVs within the restaurant that is located in Brickell. Gordon Biersch can also cater to large parties. Mr. Moes: The restaurant and bar has full time sports coverage with 32 flat screen TVs. They also have game rooms, an amazing happy hour and, as a twist, a mechanical bull. Located inside Coconut Grove, Mr. Moes promises a well-made home-cooked meal and more than 35 beers and Hard Ciders. Hooters: Just driving by any of the several Hooters in South Florida, you can hear the excited fans yelling during game night. With televisions and a large variety of food and drinks, these bars are the ideal place for a good time.